Photograph taken at the 48200 block of Morgan Lane address. DATE/TIME: June 6, 2018, at approximately 7:15 A.M. INCIDENT: Search Warrants - Outdoor Marijuana Grow. SUSPECTS: Intong Sivixay, 57 year old male, resident of Newberry Springs. Chanthavong Phonasa, 66 year old male, resident of Fresno. Luey Mith, 51 year old male, resident of Fresno. Outama Chandavong, 47 year old male, resident of Las Vegas, NV. 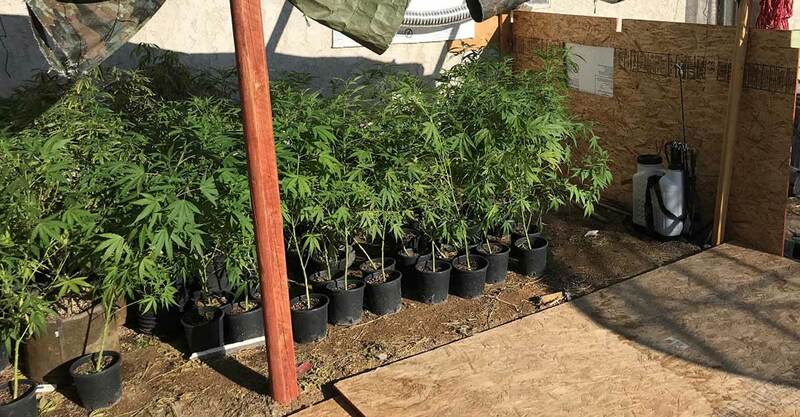 On Wednesday, June 6th, beginning at approximately 7:15 A.M., investigators from the San Bernardino County Sheriff's Department - Marijuana Enforcement Team served five search warrants at residences in the unincorporated community of Newberry Springs. All five locations had outdoor marijuana cultivations on the property. Over 3,300 marijuana plants and 78 pounds of processed marijauna were seized during the service of the search warrants. Investigators do not believe the locations are linked together. 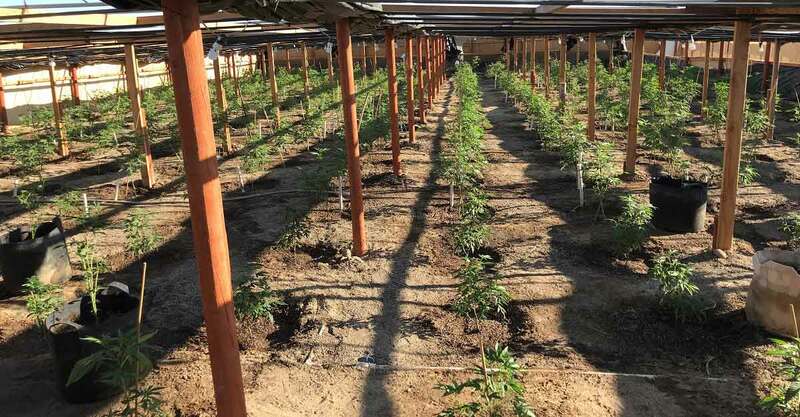 The investigation revealed the marijuana cultivations were not in compliance with California's Medical and Adult Use Cannabis Regulation and Safety Act (MAUCRSA) and/or San Bernardino County's ordinance prohibiting Commercial Cannabis Activity. San Bernardino County has an ordinance prohibiting Commercial Cannabis Activity, which includes growing marijuana plants outdoors. San Bernardino County Code Enforcement personnel will assist in the notifications to the property owners to make them aware of the violations occurring on their property. The Sheriff's Gangs/Narcotics Division will continue to enforce California's cannabis laws, as well as the San Bernardino County's ordinance regarding cannabis cultivation and distribution. Persons found guilty of violating the state law and county ordinance are subject to fines, prosecution, and seizure of property. Property owners who are growing marijuana, or are aware their tenants are growing marijuana on their properties, in violation of the state law and local ordinances may also be subject to civil or criminal sanctions. Property owners are encouraged to contact their local law enforcement or code compliance agency to confirm if cultivating cannabis is prohibited or allowed under specific regulations. Intong Sivixay, 57 year old male, resident of Newberry Springs. 724 marijauna plants and 20 pounds of processed marijuana seized. 1032 marijuana plants and 12 pounds of processed marijuana seized. 119 marijauan plants and 14 pounds of processed marijuana seized. 375 marijuana plants and 16 pounds of processed marijuana seized. Anyone with information regarding these investigations or is urged to contact the Sheriff's Gangs/Narcotics Division at (909)387-8400 or NARC-MET@sbcsd.org. Callers wishing to remain anonymous are urged to call the We-tip Hotline at 1-800-78-CRIME (27463) or you may leave information on the We-Tip Hotline at www.wetip.com. Credit: Report provided by the San Bernardino County Sheriff-Coroner Department. please visit and LIKE our Facebook site.